Thanks for choosing EventsFrame for your online ticketing. EventsFrame has been designed to be simplest and fastest method for creating tickets, managing attendees and aggregating reports off multiple events. Before you get started creating your first event, you will need to first register your account. Click on the link you received by email. 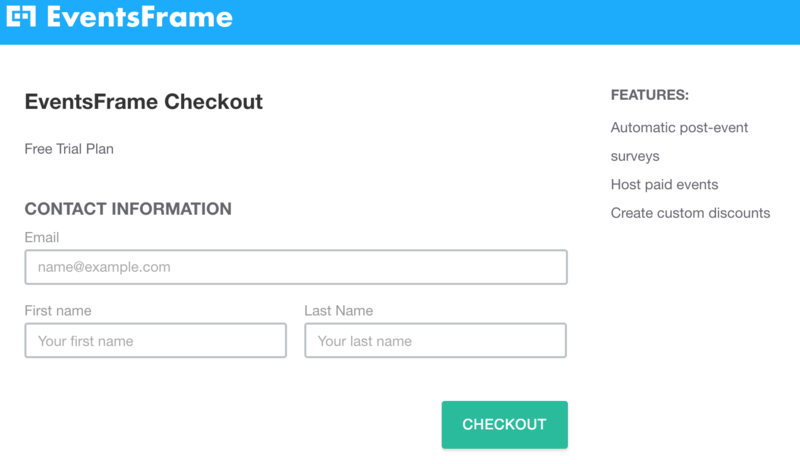 In the Checkout window enter your email address and first and last names. Wait a few seconds and head over to your email inbox where you will have been sent confirmation of your new account with sign in instructions. Use the link in your email or head to app.eventsframe.com to sign-in. You are now ready to get started creating your first event! Head on over to app.eventsframe.com to sign-in.